Happy Friday! 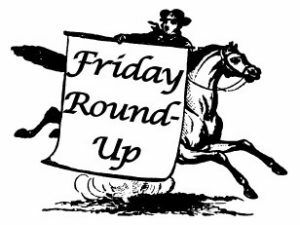 We had a not terribly funny April Fool’s Day issue this week with the website. As you may have seen, our website was offline for over 24 hours. After checking in with our provider, the issue was someone using the server where PHW’s website resides for spam emails. While our website is back up, our mailing list may not be functional yet because of someone else being inconsiderate. With that in mind, we will have to keep the topics rather broad this week – no time sensitive events. If you receive this email weeks into the future and have no idea why its so late, now you know. We had a tip this week that Pizzoco Pizza in the former Conoco gas station at 501 North Loudoun Street had their soft opening the end of March. If you enjoy staring at pictures of food while stuck at work, check them out at their website, Facebook, and Instagram. We are so excited to see this formerly vacant building be given a new lease on life, especially after so many people seemed to think the building was hopelessly obsolete. Historic buildings are the perfect incubators for small businesses and creative solutions. For some more reading, we came across an article on General Daniel Morgan written about ninety years after his death and thought others may like to see the historic perspective on his life in the area in the 1890s. Much of it may be familiar to you, but if you would like to peer back through time, you can find the story in Our Church Paper (Evangelical Lutheran Church paper for New Market and Shenandoah County), March 17, 1897 on page 4. It took a while longer than the author of this article likely could have anticipated, but at long last we do have a monument to Daniel Morgan near the site of his first interment, and the children of Winchester will learn his name through attending Daniel Morgan Middle School. 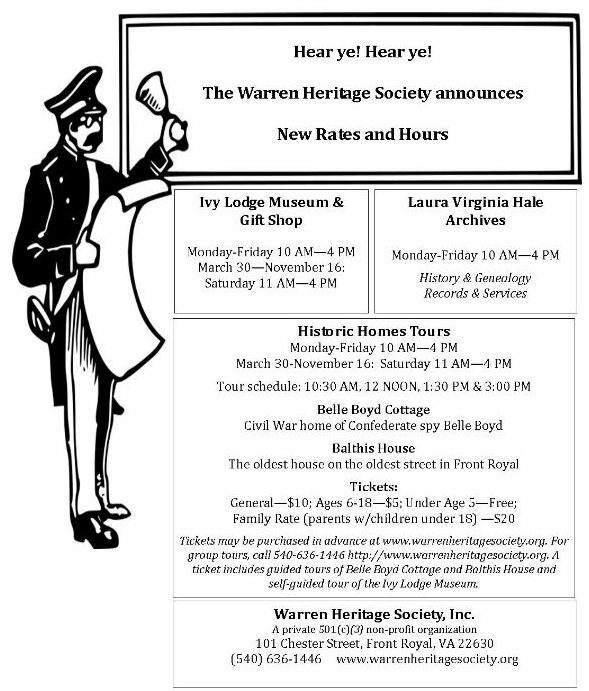 Belle Grove Plantation opens for the 2019 season tomorrow, March 23 from 10 a.m. to 4 p.m. Manor House tour admission will be free of charge. Throughout Opening Day, guided tours will begin at :15 and :45 past the hour with the first tour beginning at 10:15 a.m. and the last tour beginning at 3:15 p.m. You can find more details on Facebook. Handley Regional Library is getting a new website next week. On March 27 between 6 a.m.-8 a.m., the website and catalog will be updating, so you may experience a brief interruption of service. The website URL will still be www.handleyregional.org. You can find more information about the upcoming change on this page of their site. This will probably impact some links in the PHW website’s research section, so we will update those when the changes go live. Tim Youmans, Winchester Planning Director and local historian, will provide an overview of Winchester’s history at the Winchester-Frederick County Historical Society’s annual meeting on March 28 at 7 p.m. in Rouss City Hall, 15 N. Cameron St. This event is free and open to the public. You can find the event on Facebook here. From “Interior Woodwork of Winchester Virginia” by Virginia Miller and John G. Lewis, page 121. We also had a question about “Winchester mantels” this week. You might have heard us or other groups point them out at house tours in the past. 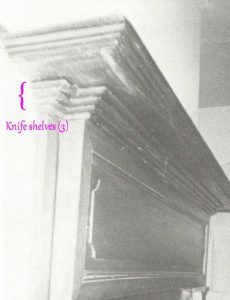 They are a visually distinctive mantel ornamentation that contains one to three very sharply tapered “knife shelf” ledges of molding beneath the mantel shelf. Many examples are much more pronounced and deeply cut that the example photo (roughly, the finer the home, the more deeply the molding was cut). The term appears to have been coined by Irvan O’Connell, Sr. as he worked on restoring homes in the 1960s. The mantels are believed to date to 1820-1840, but examples have been transplanted to different locations around town over the years and should not be used as a sole indicator of house age. If this has whetted your appetite to learn more about Winchester’s local woodworking styles and expressions, a few copies of Interior Woodwork of Winchester, Virginia are out in the wild, or you may stop by PHW’s library to check out our non-circulating copy. Tonight, March 15, is the John Kirby Tribute Concert at Westminster-Canterbury. The concert will celebrate this Winchester-born jazzman who played a significant role developing “classical jazz” in the 1930s and 40s. Bob Larson, Chair of Jazz Studies at Shenandoah University’s Conservatory, will lead a jazz sextet recreating John Kirby’s “Onyx Club Band,” with an appreciation by Alan Williams, grandson of John Kirby. The event is open to the public, $10/person admission at the door. A portion of the proceeds goes to the SVWC Fellowship Fund. The Patsy Cline Historic House will be hosting a volunteer open house day March 23 and 24. If you would like to learn more about volunteering, please join PCHH’s staff and volunteers for a special open house on Saturday, March 23 from 10am to 2pm, and Sunday, March 24 from 1pm to 4pm. Volunteers provide the vibrant spark that makes the site both educational and compelling. If you enjoy being a docent for Holiday House Tour, check out this opportunity. The CUP for the old hospital site was tabled on Tuesday. The public hearing portion of the application is now closed, but Council has requested the applicant return with more information on how it plans to mitigate the concerns raised by neighbors and council members. Parking and the increase of traffic in the neighborhood, as well as the scale of the building, remain major concerns. The item is planned to return to City Council on March 26. We have also added about 34 images to our Flickr account since our last update, including Revolving Fund documentary photos of Cameron Street, contact sheets of event photos connected to the Kurtz Cultural Center, and three photos connected with Miss Lucy Kurtz and her father George Kurtz. You can catch them at the top of the Flickr photostream. 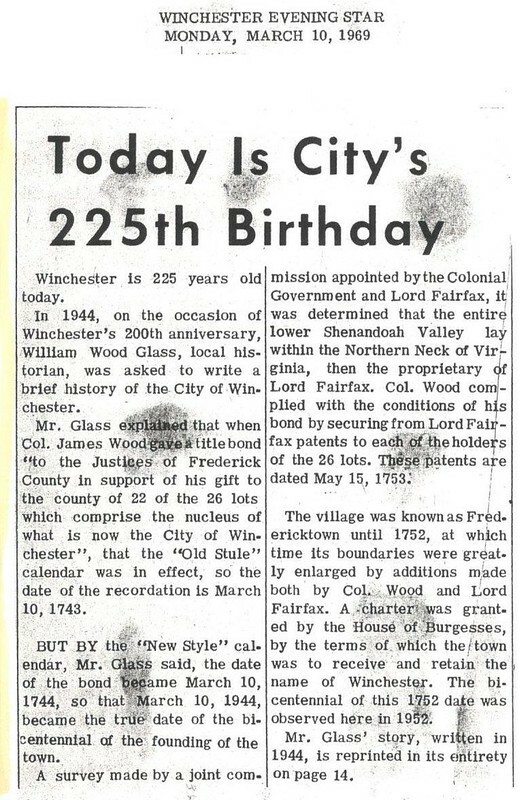 While we missed Winchester’s official birthday, we hope you don’t mind a belated gift – an article from 1969 on the 225th birthday of Winchester, with a lead for finding a history written in 1944 to mark the 200th anniversary by William Wood Glass. A number of his surveys on historic sites around Winchester can be found online at the Library of Virginia. It might seem early, but artist applications for the 2019 Bough & Dough Shop are open! The Shop will be held at the Hexagon House between November 22 and December 15, 2019. With last year under our belt, we have a bit more information to share with potential artists in a small booklet with the application. Applications are also available online through Google Forms and printed copies will be available at the office. We will be reviewing applications for new artists starting at our March 11 board meeting. We do have one item to note for potential artists we may have spoken to last year at the shop but not had contact information to follow up – commission fees for 2019 have increased to 25%. We are still a no table fee and no application fee event, and admission to the shop is free for shoppers (or anyone curious to see the Hexagon House). If you could not make it to the City Council work session to hear the discussion on the Conditional Use Permit for the old hospital site, the City Council meeting from February 26 is available for review on the Meeting Portal. The application is scheduled to return to City Council on March 12. You may also want to review HDP’s video of a 3D rendering of the proposed new construction. We hope HDP will continue to work with the neighbors and address their issues throughout this process, particularly exterior design and landscaping choices and addressing the uptick in traffic and parking. For something a bit different, we have a link to a historic article on a topic that many people may not know about. We don’t talk much about Winchester Gas and Electric Co. in our history of Winchester despite its establishment here in 1853. By chance we came across an article this week that goes into some detail on the company’s history and its re-invigoration in 1922 after years of poor management and dilapidated equipment had taken its toll. Take a look at Reviving a Run-down Gas Plant in the September 16, 1922 Gas Age-Record for both a glimpse at an underappreciated piece of Winchester’s vanished history, along with numerous photographic illustrations of the town and the plant. Happy reading! The Winchester Gas and Electric Co. buildings were located on the corner of Kent and Boscawen Streets where the Court Square Autopark is today. The stone wall still exists at the Joint Judicial Center’s Boscawen Street side. The wall was part of the fence of the Conrad House property. PHW was in attendance for the kickoff press conference on Winchester’s 275th Anniversary on Wednesday. As you know, we are working on touching up the Limestone, Sycamores & Architecture book for reprinting this year as part of the celebration, as well as chipping in with a few other things along the way (probably involving some big event we usually have in December…). There will be many great activities through the year, so keep an eye on the website – there is sure to be more to come! The French and Indian War Foundation is celebrating George Washington’s 287th birthday on Friday, February 22 from 5:30 to 8:30 PM at the Half Note Lounge in the George Washington Hotel, 103 E. Piccadilly St. The event is free and everyone is welcome to attend. Delegate Chris Collins will speak at 6:30 PM. There will be a cash bar and appetizers by Chef Marvin at $20 a plate. You can find the event listing on their website for more information. In more business related news, Preservation Virginia is keeping tabs on items moving through Virginia’s House and Senate. You may want to drop by their website and sign up for their email newsletter to stay informed. The main concern is watching the historic tax credit (likely to be capped at $5 million, but according to Preservation Virginia this previously implemented change was not a significant blow to preservation efforts) but historic African American cemetery funding, war memorials, agritourism, and land conservation are all topics being watched by Preservation Virginia. Warren Heritage Society is announcing new hours and rates for 2019. They are actively seeking volunteers to help with their new Saturday hours – contact them if you can help! We know a number of our members and readers are following the development at the old Winchester Memorial Hospital site on Cork Street. From the Winchester Cit-E News from January 23, ” After much discussion, Council decided to table the item until the February 12th Work Session in order to allow Council more time to gather additional information from the applicant and to review public feedback.” You can find the documents relating to the application starting on page 94 of the agenda packet for January 22. There is much to read and digest here, but we recommend reading through the neighborhood concerns and worries to gather a fuller understanding of the issue prior to the February 12 meeting. And should anyone be looking for one of the essays printed in Old & New Architecture: Design Relationship printed by the National Trust, PHW has a copy of the book available in our office library. Last but not least, we have pulled the PHW file on the 1990 rezoning of the Old Hospital site and we are happy to provide copies of our statements to researchers. Looking to expand your historic image and content searches for Virginia and West Virginia? The Digital Public Library of America has a new hub service Digital Virginias, with more than 58,000 items from the University of Virginia, George Mason University, William & Mary, Virginia Commonwealth University, Virginia Tech, and West Virginia University. A quick search for Winchester in this subset turned up not just photographs, but also a wealth of medical records for West Virginia soldiers treated in Winchester and telegraphs exchanged during the Civil War. You might want to take a look at some of the school images from the University of Virginia Library in particular; they seem to show the original John Kerr School classroom in 1921. Let us know if you find something intriguing! First, are you looking for some new reading material? Through January 31, 2019, AmazonSmile will donate 15% the purchase price of new print magazine subscriptions to the charity of your choice. Visit https://smile.amazon.com/b?node=18541223011 for details. Check it out and select PHW as your charity to give us a little boost at no extra cost to you! Second, we are zipping along on the Limestone book faster than anticipated. We will probably have the first chapter ready for the proofing team the week of January 21. Let us know if you would like to join the editing team at phwinc.org@gmail.com or 540-667-3577. Copies of the previous Limestone book can be provided to volunteer editors for text and image comparisons. Third, are you looking to expand your grant writing skills in 2019? The Foundant for GrantSeekers is sponsoring a free webinar “Planning Your Own Pathway to Grant Guru” on Thursday, January 31, 12pm Eastern. Learn more and register here. Related, you may also want to check out the recent Q&A post at the National Trust for their various grant programs. You can also find a link to the recording of the recent webinar that served as the catalyst for this round of questions. Fourth, we are working behind the scenes for Holiday House Tour 2019 (tentative dates Dec. 7 & 8, 2019). This year’s event will coincide with the 275th anniversary of Winchester, and we are hoping to find houses to open from each century to showcase Winchester’s variety of architectural expression and history. We have two possibilities for homes from the 1790s and 1890s in the West Cork and Clifford neighborhood. If you have a home or building that is near this area, especially if you are in a home from the early 1900s through the current day, please let us know at 540-667-3577 or phwinc.org@gmail.com. Our preference is for buildings within relatively easy walking distance, so a neighborhood we have never visited like Lee, Stonewall, Joist Hite, Shirley, etc. could be a possibility. We have readers and members in this area, so if you or someone you know might be interested in opening your building for tours, speak up! Of course, we are also working on Bough and Dough 2019. We had overwhelmingly positive feedback for the changes in 2018. We are in the process now of dotting i’s and crossing t’s for an expanded format with a tentative date range of Nov. 15 to Dec. 15, to be held again at the Hexagon House. We hope to have our application and information forms together in early February, and we will be sure to post here and on our website when those are live. If you are an artist hoping to jump in this year, our feedback indicated shoppers would like more pottery, ornaments, jewelry, and food items like fruit cake and mulled cider spices. We have discussed food trucks and artist demonstrations/workshops but logistics for these may be tricky (especially indoor setup). We will most likely have a few open house days again this spring and summer for prospective artists to stop in and see the space and planned setup to determine if we’d be a good fit. Keep an eye out! A few times a year, we receive a question about insuring a historic building. This discussion recently came up on the National Trust’s online forum as well, and many community members shared strategies for talking to an insurance agent or some lesser known insurance agencies that are equipped to handle these special cases. Visit the Forum Connect discussion on insuring historic properties to see if this can help point you in the right direction for getting the appropriate insurance for your property. We have been scanning away at the office, but this time it’s not for Friday Photos – instead we are working on the Limestone book reprint. However, you might want to pop over to our Flickr and check out the new Unidentified and Miscellaneous album. These are the odds and ends that were hanging around – let us know if you recognize any of the unidentified pictures! Speaking of the Limestone book, we are still open to anyone who wants to be on the proofreading team. Drop us a line at 540-667-3577 or phwinc.org@gmail.com. We will be starting proofreading, fact checking, and potentially some image replacements chapter by chapter in late January the end of March. We can send files to you digitally, so you do not need to attend in-person meetings or work on a strict time schedule. Familiarity with the original book is not needed but may be helpful. In other behind the scenes news at PHW, we are finally getting a filing system in place for our Frederick County architecture files. While most of our research files are based in the Winchester Historic District and easily filed by street and house number, we do have some files for interesting and important places in Frederick County. Most of those files, however, are only known by the closest intersection, community, a family name, or a building name – a much trickier task than street names when designing usability for future researchers and file expansion. As a starting point, we have set up our Frederick County files by magisterial districts and precincts. While the collection is small at the moment (about one banker box) we are looking forward to seeing this collection grow. We didn’t get to do too much exploration of our news feed over November and December, so it was a pleasant relief to find many of our favorite sites compiled “best of 2018” stories to browse. Here’s a small sampling of things we enjoyed reading over the past week. Rachel Quednau applies what is happening in Milwaukee with mixed-use development and takes a quick look at some other locations facing the same issues. Be sure to read to the end for examples from locations that are thinking outside the cookie-cutter box to provide storefronts that are reasonable for small businesses to rent and thrive. The National Trust for Historic Preservation rounds up what we know so far about Opportunity Zones and how they impact historic preservation. They will be hosting a webinar on January 17, so be sure to click through to the article and find out how to sign up. Researchers rejoice! Open Culture reports on the watershed of art, literature, photography, and more entering public domain for the first time in twenty years. If you’d like a little more background on the topic, also check out For the First Time in More Than 20 Years, Copyrighted Works Will Enter the Public Domain at Smithsonian.com. We know people are also probably very curious about Holiday House Tour. We estimate about 300 people enjoyed the event despite the rainy Saturday. The new format for the Bough and Dough Shop was also a success, finally surpassing the all time high sales numbers reached in 2000. This was the year the Shop was set up at the former location of the A&P grocery store, 525 Amherst St., and boasted over 35 vendors. That year was by far the largest space and the most vendors the Shop ever had in its 40+ year history, so topping that figure is truly a benchmark moment for us. We would like to extend our thanks to all our guests, homeowners, volunteers, artisan vendors, and sponsors who helped us make our holiday fundraising a success. We literally could not do it without all of you. We will be going through our internal debriefing on January 14, so if you have not turned in feedback yet, there’s still time! You can find the Shop survey and the Tour survey on SurveyMonkey.